You don’t need to purchase fertilizers or use harsh chemicals on your garden to stimulate growth. As an alternative, why not make your own compost pile? Compost piles are natural fertilizers and act as a super food to the plants in your garden; plus, they’re easy to make! In the twenty first century, we produce more waste than we know what to do with, and some of that waste can be useful in our gardens. Here are a few compost building tips. Think Earth Tones – Most people don’t know what should and should not be included in their compost pile. For clarity, follow this simple rule of thumb: think green and brown. For brown include things like dried leaves, twigs, straw, pine needles and wood chips. 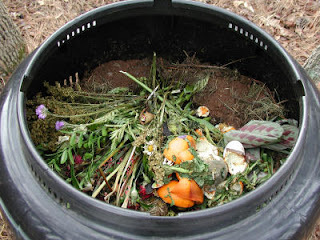 For green include fruit and vegetable waste, weeds, grass, and manure. Organic is key. What to Avoid – Even though eggs, dairy, and other animal products are organic, avoid adding these to your compost pile. The problem isn't that they’re bad for your garden but rather that animal products, like dairy and eggs, tend to stink during decomposition. The stench tends to attract burrowing animals that can reap havoc on your garden. Avoid adding these to your compost, unless you have a foolproof way of masking the smell. Water is Crucial – Compost piles aren't made overnight; they are built little by little, day after day. As you add each new layer to your compost pile, make sure you add water as well. Simply use your sprinkler system or watering can to add moisture to the new, dry layer. This added moisture will help speed up the decomposition process. These are the basics to building your compost pile. Try to keep your pile covered as you want to trap in the moisture to speed up decomposition. After a few short months, your compost pile will be ready for your garden!